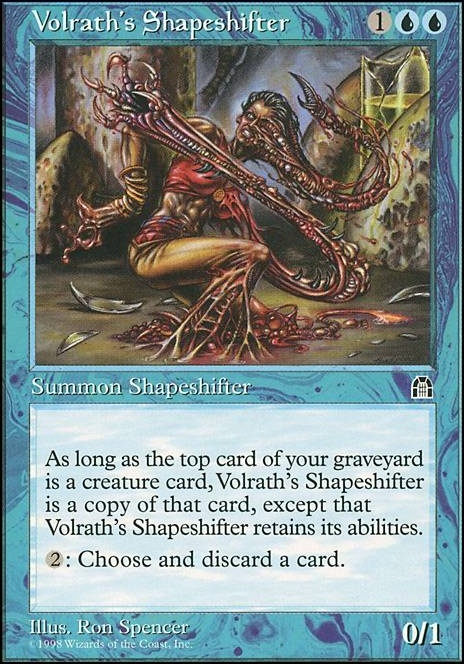 Volrath's Shapeshifter and Named Cards? Chasm Skulker - Yes this will instantly be out of Tetsuko range once you draw a card, but you are drawing so many cards that I feel you could build this guy up to be massive quite quickly. Plus when it dies, you get a bunch of unblockables. Thassa, God of the Sea - Just another way to give something unblockable that is also a win-con herself. Captain's Claws for more unblockable dudes/dudets! Personally, I would play Disallow over Arcane Denial or Stifle as I feel it is more flexible and I don't like letting my opponents draw cards. 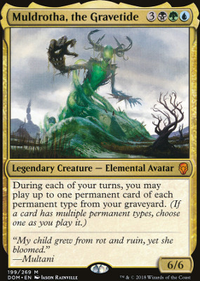 Gigantoplasm - might be a fun way to copy a creature with an awesome ability and still retain the option to be unblockable. Volrath's Shapeshifter or Warkite Marauder could also be fun ways to mess with P/T. Free tracking and insurance on anything over $25 total! Hey there, I'd just like to suggest Volrath's Shapeshifter. 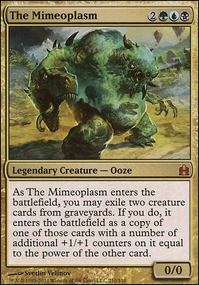 I'm a big fan of it in general(it's really powerful in dimir) but if you're running Phage anyway it's pretty hilarious. I'm suprised you're not running Animate Dead, Necromancy etc. Dimir does the reanimate thing better than most and it might be worth looking at. I'd cut some of the cutesy stuff like Memory Plunder, Desertion etc for them personally. bushido_man96 I get where you are coming from and under other circumstances your suggestions do make much sense. It's not that I rely on this one 5 colour deck for all my games in the same playgroup though. We all have some decks to change and the matchup multicolour against mono seems to be particularly bad, so I wanted to find ways to improve that. The "trick" with trying to build something that appears weaker than it is doesn't really work imo. Usually I try to kill the player first, who is easiest to remove in the early game, because he might play something that is hard to remove later in the game. It depends on the commander and if I know the deck and player, but doing unsuspiscious stuff in the beginning often means that the real action comes afterwards. If I don't want to worry about blood moon at all, I can always play one of my other decks...I have one for every colour, Rhonas, Purphoros, Xiahou Dun, Jhoira (90% blue), Brimaz, my best deck is probably UW Stax and I have a Gitrog Monster. During one evening I don't play all decks, usually I play a deck until I have won once or twice, then take another one. Last week I happened to run into mono R and mono U with the 5 colour combo and the games showed some flaws in my deck. I managed to get rid of a Magus because I topdecked the single basic plains in the deck and hand a Path already available but I wasn't able to remove a blood moon even though I had a recruiter and Kiki Jiki...if that doesn't work, there's clearly something missing in the deck. I do quite well with the 31 lands because there are mana dorks and some artifacts. I'm always somewhere between 30 and 33 and the amount of mana usually isn't the problem...with one free mulligan there's a good chance of getting what you need. The choice of lands is imporant though. I've removed Volcanic Island for an additional basic forest because I rarely need the combination UR. I tried removing Anger now because that was my main reason for playing duals with red but without green...and Anger was mostly needed for a trick with Master of Cruelties/Volrath's Shapeshifter and I kicked that combo out. The importance of Badlands still needs to be checked. I do want to keep the shocklands with green though, because green is my main colour. What makes it difficult to cut something is that all the combo parts interact with something else and it's hard to find out what can absolutely not be thrown out and what is just a nice gimmick but not essential. Volrath's Shapeshifter and Defense of the Heart for example look great but I am not sure how much they really do in the current build. 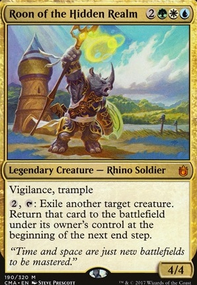 Defense can win the game if it triggers, but the requirement of 3 opponent creatures might be hard to meet by the time I could win with something else. I'm testing Flametongue Kavu now, maybe Ghitu Slinger and I have Birthing Pod and Reclamation Sage in the deck again. We are opening some HOU displays tomorrow and I hope to get a Razaketh. Jin Gitaxias has also arrived yesterday, so I'm going to test him too as one of the reanimation targets. Cryptolith Rite might replace another land, because it makes all creatures into mana dorks...with all that specualtion and your inputs I think I should rather test some chances and see how it works in practice. I don't have a Sneak Attack but this and the EE dlamars suggested are on my watchlist. 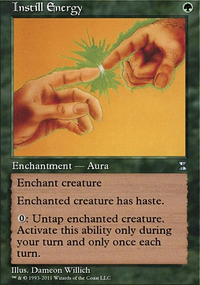 I'm still in favour of instant/sorcery removals (besides creatures with built-in removals) because Snapcaster Mage can reuse them and I've got nothing to make artifacts searchable or reusable. 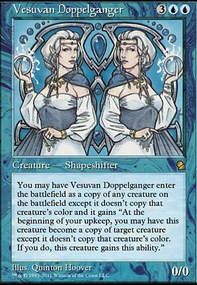 Dimir Doppelganger is an backup plan when it doesnt work with Volrath's Shapeshifter.